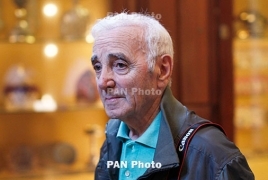 PanARMENIAN.Net - The 44th annual César Award will be dedicated to legendary French-Armenian crooner Charles Aznavour who passed away on October 1 at the age of 94, Le Figaro reports. In a statement, president of the Academy of Cinema Arts and Techniques Alain Terzian said that parallel to music "his film career was admirable," as Aznavour starred in more than 60 films. "A singer, songwriter for movies too, he was also a huge actor who wrote scripts or dialogues." Born to Armenian immigrants, Aznavour sold more than 180 million records and featured in over 60 films.